Religious Zionist leader's passing 'leaves a vacuum,' the OU, Young Israel say Monday. News of the passing of renowned religious Zionist leader Rabbi Dr. Aharon Lichtenstein has reached the US on Monday, as American Jewish organizations react to the loss. 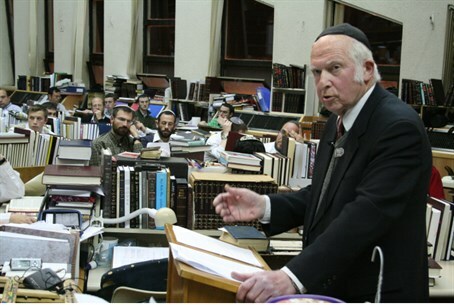 “Rabbi Dr. Aharon Lichtenstein was a preeminent Torah scholar and an intellectual giant who had a profound impact on his students, the State of Israel, and the Jewish nation as a whole," the Young Israel organization stated Monday. "Rav Lichtenstein inspired an entire generation through his immeasurable contributions to the religious Zionist movement and the tremendous depth of his rabbinic scholarship, which left an indelible mark on the Jewish world." "His passing creates a large void in world Jewry that will not easily be filled. May G-d comfort the Lichtenstein family among the mourners of Zion and Jerusalem," it added. The Orthodox Union (OU) also mourned the Rabbi's passing. "The Orthodox Union and its board and professional staff join with the rest of the Jewish nation in mourning the passing of HaRav HaGaon Aharon Lichtenstein," it said in a statement. "A prince and a giant has fallen." "Rav Lichtenstein was a prince of Torah and exemplified the highest ideals of Torah U’Maddah," it continued. "He was a giant in his Talmudic expertise, his broad-ranging wisdom, and his exquisite sensitivity to other human beings." "His passing leaves a vacuum which will not easily be filled."